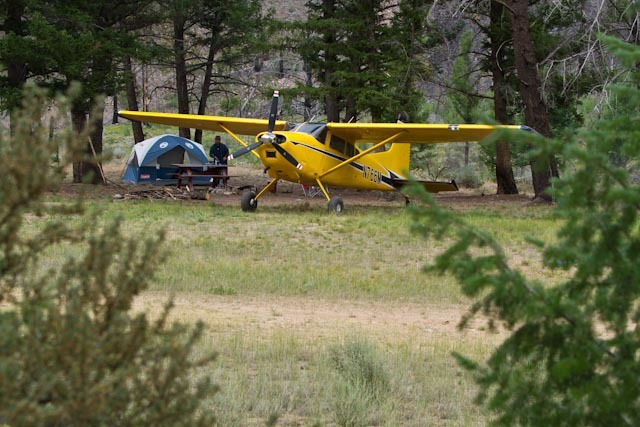 Upper Loon Creek in Idaho is an amazing backcountry airstrip, perfect for airplane camping. My son Corey asked me a couple weeks ago if we could schedule a trip to the Idaho backcountry and spend a few days camping. He was able to get some time off from work and I was eager to adjust my schedule so we could go. I have been itching to get out all summer. 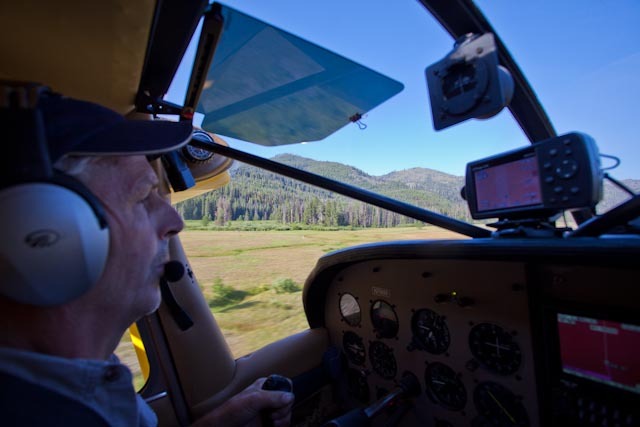 He and I have been traveling in the airplane together since he was about 7 and have enjoyed many trips to remote airstrips in Utah and Idaho over the years. We have been to Oshkosh together as well as several times to Baja. I can’t describe how rewarding and memorable each of these trips has been. He is nearly 22 now and has been away from home for a couple years so I have been looking forward to this opportunity. I got the plane fueled and mostly loaded so we could get an early start the next day. When the alarm went off at 5:30 in the morning I forgot for a moment this was the day and rolled over to go back to sleep. About a half minute later I jolted myself out of bed when I realized we had plans to be in the air by 6:30. With beautiful blue skies and early morning cool temperature, the airplane easily lifted off and headed north loaded with all our stuff. Fishing and camping gear, guns, camera equip and more food than we could possibly eat. With only the two of us in the plane, the Cessna 185 can carry everything we wanted to bring. I love early morning flights in the summer time. The air is usually smooth and fresh and this day was no exception. Almost as soon as we got out of the pattern our conversation turned into a discussion about VOR navigation. Corey has just started cross country flights in his training so when we passed by the Ogden VOR I had him tune in 115.7 and center up the needle. We talked about radials and how to determine position, as well as tracking inbound and outbound. The old Morse code identifier and needle dialing seem archaic compared to new generation GPS navigation. I still enjoy it and Corey was fascinated with the old trusted system. He quickly caught on and seemed able to do the basic functions right away. As we traveled further north and into the mountains the navigation method turned to pilotage and dead reckoning and interpreting the sectional chart. I let Corey do the flying and navigating from the right seat to give him as much experience as possible. 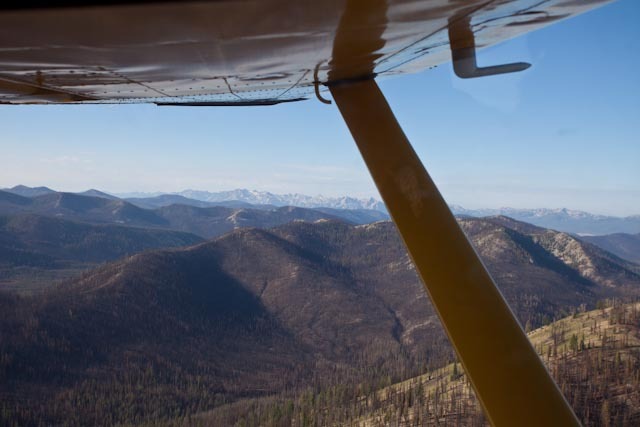 The plan was to fly directly to the Upper Loon Creek airstrip. My thought was to see if any other planes were there and if so we would continue north on to another airstrip. I had landed at Upper Loon once before and my recollection was there was only one defined camping spot. Not remembering many other details of the strip I thought if no one were there we would land, assess it and be ready to move on if it didn’t meet our expectations. If we had any hesitations we would get back in the plane and head on another 60 miles to Chamberlain, a place we both know well and always enjoy. We have camped at Chamberlain dozens of times over the years and never been disappointed. It seems like when I go to a familiar restaurant I always order the same item on the menu. I know it’s good and I don’t want to risk having something that may not be as satisfying. It’s no different when I go somewhere in the airplane. I tend to be drawn to familiar spots I know. The adventurous part of me, however, likes to explore and find new places and experiences and I have an internal battle trying to decide whether to go somewhere familiar or risk a new place. Upper Loon has been on my list for a while and I have been wanting to check it out and find out more about it. 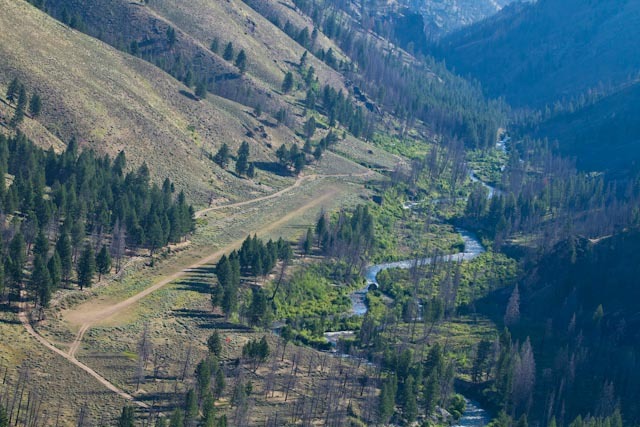 The Idaho backcountry is a beautiful and intimidating expanse. The rugged and hostile terrain is tempered with hundreds of landing strips that provide access to this area. These airstrips offer some peace of mind knowing if mechanical problems develop you are never too far from a place to land. 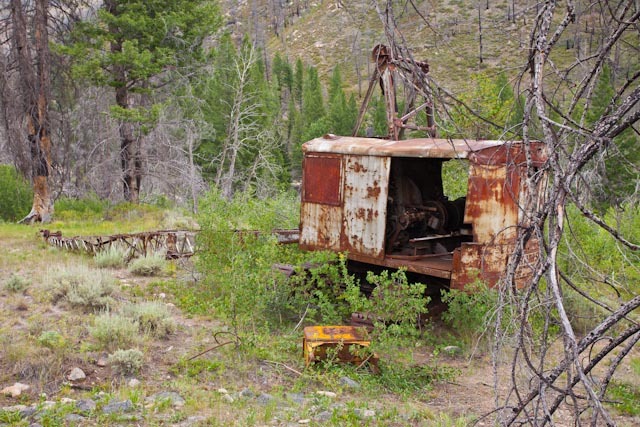 There is a lot of activity in the backcountry including commercial mining, logging operations, and forestry. 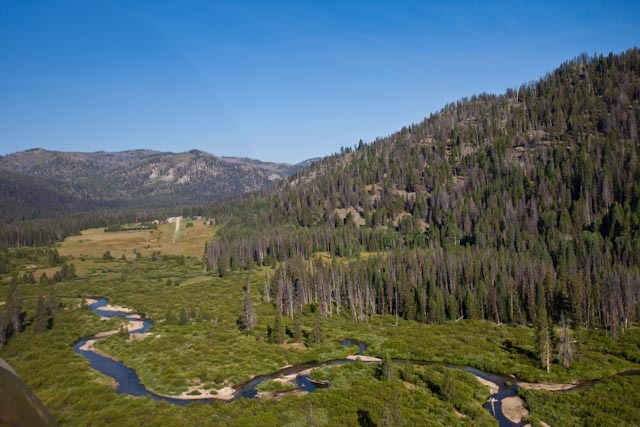 There are multiple recreational opportunities like river running, backpacking, fishing, hunting and horseback riding and off road travel. 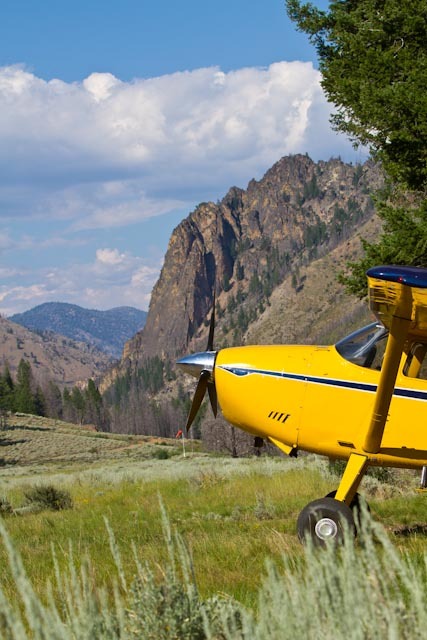 The airstrips provide access for firefighting, mail delivery, and sportsman access not to mention the recreational aviation activities I enjoy. 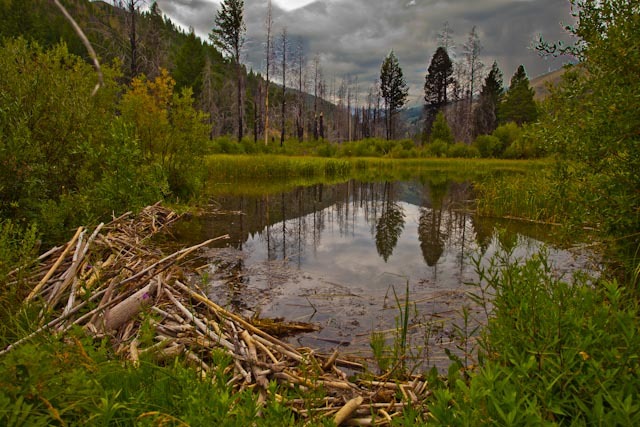 There is some road access to many lodges and cabins and forest service maintained campgrounds. There is also a lot of wilderness areas, some of which have airstrips. These places do not allow any mechanized equipment except for the airplane. It’s a unique and beautiful area full of history and has attracted people for a variety of reasons for nearly 2 centuries. Even with all the activity in the backcountry, there is still an incredible sense isolation. The peace, beauty, and serenity is accompanied by intimidation from an area known to be rugged and hostile. It’s a land to love and a land to fear and flying over it is a humbling experience. I feel a surreal sense of gratitude and emotional appreciation as I sit comfortably in my airplane looking out the window. I feel blessed to be there and lucky to have the opportunity to spend a little of my time in such a special place. I also feel a little edginess because I know the risks. I know if there is a problem it could easily become serious. I consider the factors I know affect the safe arrival at our destination. The winds and weather, the runway, my skill level, the smoke and fires, my airplane, the weight we carry. All these things add up to something that makes you feel alive. The challenge, beauty, anxiety and unique aspect of flying to these destinations create memories that don’t fade. Those who have never experienced this will never really understand what you try to relate to them. 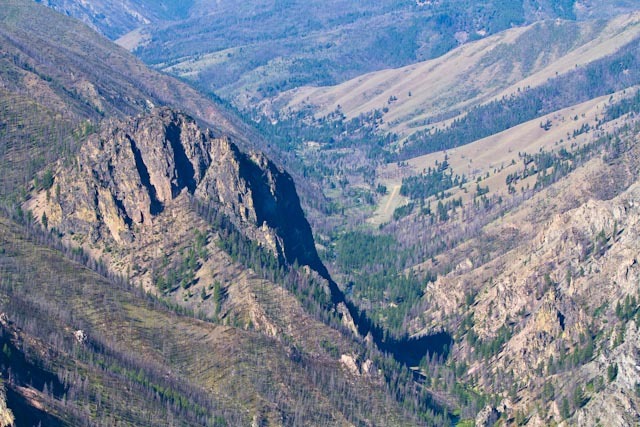 As the Salmon river passed below we realized we were getting close so I took the flight controls and within a few minutes descended down into the valley carved by Loon Creek. Within moments, we could see the airstrip next to a straight stretch in the creek. Windsocks situated on both ends of the strip hung limp and no other aircraft were in sight. Time to get set up and plan the approach. Overflying the field gives a great opportunity to assess the surface, the winds and memorize the features. 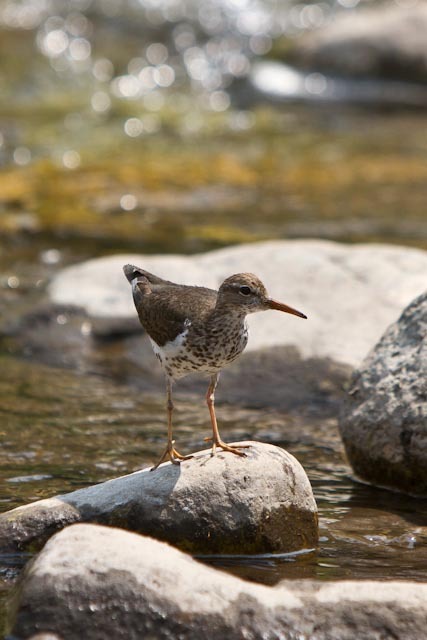 In most cases landings are made upstream and take offs downstream in the backcountry. I suppose a tight downwind and base leg could work here but it seemed a bit tight especially for a guy like me who only flies the backcountry recreationally 4 or 5 times a year so I went on downstream a few miles where I could comfortably turn around in the canyon and head back. I got the airplane slowed to a comfortable speed and altitude, around 80 mph and a little over 800 feet above the 5500 foot field elevation. On about a mile final there is a large rock outcropping on the left that partially obstructs your vision of the runway until you get close to it. It’s an impressive sight and feels ominous but an easy banking maneuver gets you around it and leaves you feeling in awe. The terrain rises about 25 feet in elevation on the northwest end of the runway which does not constitute a problem but can give a feeling of a need for a steeper approach than usual. The 185 slowed to 60 and gracefully flew down the final approach and touched down right where I wanted it to. Not quite as smooth as I had hoped but certainly adequate. With 2500 feet of gravel runway there is plenty of room for the roll out and stopping the aircraft before you get to the camping site on the left in a small grouping of pines. I shut down the engine, triple checked the master switch was “off” and jumped out. There was no need to think about the decision of staying because it was already made. 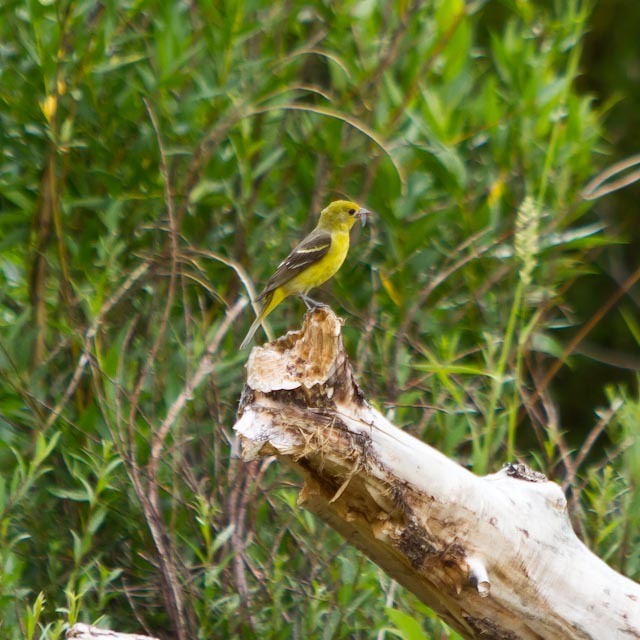 We were greeted by the sweet sounds of songbirds, the smell of pines and a breathless 68 degrees. 2 hours and 15 minutes earlier we had left our home base Bountiful Skypark and here we were in the heart of a wilderness area ready for 3 days of outdoor activities and relaxation. No phones, no airplanes to fix and no pressure. It’s an exhilarating feeling to realize the experience you just had and where you are. The next 30 minutes pass quickly as the plane gets unloaded, the tent set up and everything organized. 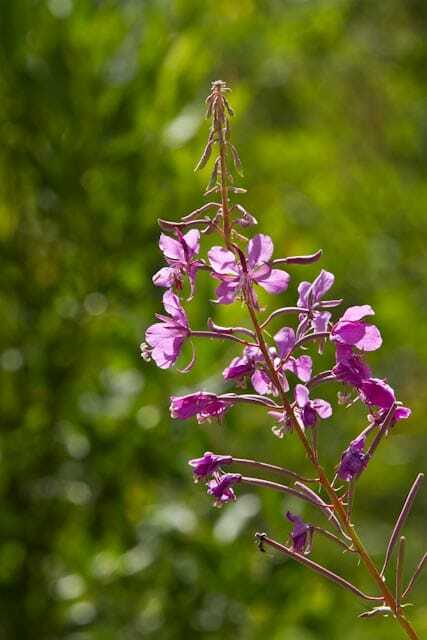 The important thing to do now is sit down and take some deep breathes of fresh mountain air, drink a cold drink and contemplate what the schedule will be for the day. Soon you realize there is no schedule and that sitting there doing nothing feels pretty good. The cool air soothes your body, the sound of the nearby creek relaxes your soul and the faithful airplane majestically parked in front of you gives humble feelings of gratitude. If it weren’t for this incredible machine you would not be here. There is no question a pilot develops a relationship with the airplane he or she flies. Those who haven’t experienced it will not understand but this friend you have, this airplane that safely protects you and carries you from place to place becomes a part of you and a bond is developed. It doesn’t take to long for my restless nature to cause me to reach for my fly rod and start thinking about the fish needing to be caught. Corey wanted to fish also and so we put some shorts on, grabbed a few snacks and headed down the hill to the water. Access to the stream was more difficult than I thought it would be. It’s fairly steep with loose rocks and overgrown with a lot of foliage, fallen trees, and branches. The trip is worth it though because the creek is beautiful. 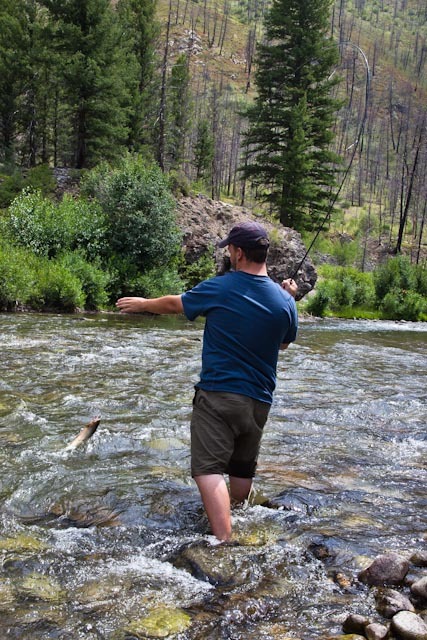 We are not the sight of picture perfect fly fisherman since we don’t have waders, fishnets and the special hats those guys wear. I have never been the guy who dresses up to do things like fishing and riding bikes. I don’t even know the knots a self respecting fly fisherman knows and I don’t tie my own flies. But I love getting out in the creek and casting the fly around and can usually get it to land somewhere near the spot I wanted it to go. 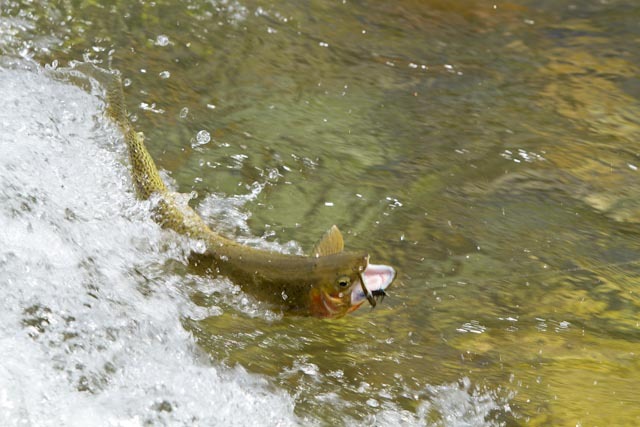 I have found fly fishing to be very therapeutic and enjoyable and I don’t have to catch fish to have it be fun. 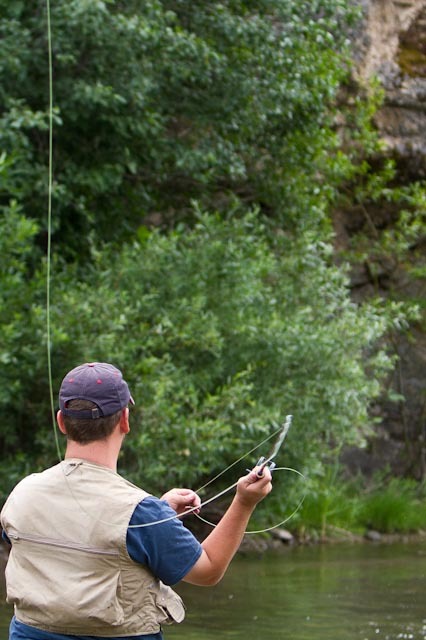 I have been fly fishing since I was a kid but never considered myself an expert. I don’t care though, because I love it anyway. 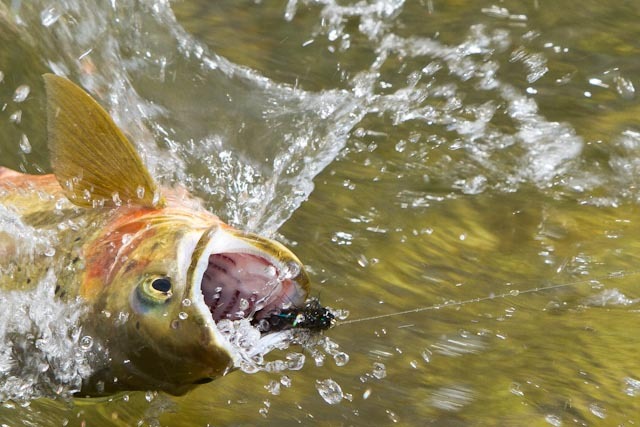 I have almost always found a tan hopper looking fly that floats on the surface to be effective while fishing in the Idaho backcountry and so that is my first choice when I start fishing. Within a couple minutes, I caught a little 6 incher so I had hopes we would be successful with plenty of action but the next 30 minutes of our efforts were fruitless. I started wondering if a different color fly would do better so I put on a medium sized black fly that mostly stayed submerged and within a couple minutes hooked a nice foot long cutthroat trout. This is a respectable fish for me and I must admit I was a little proud of myself. Corey changed flies and began having success also. The next day I brought my camera down to the river and took some photos of him bringing one after another in. He caught one that was about 14 inches. The creek runs swift and with our slippery water shoes, it was a challenging and strenuous effort to move around or across the creek. In places, it is much deeper than I would have expected. We nearly fell dozens of times but luckily never did. I was concerned when I had my camera since I didn’t want to fall with it. Lowreys season salt makes a great easy dinner and that was our menu that day. Corey said it was great. Cooking over a fire seems to always make a satisfying meal and we ate more than enough. Darkness came and as the stars started appearing we took a blanket and spread it out in the middle of the runway. We must have laid there for an hour watching falling stars and marveling at the unthinkable expanse of the universe. Barely visible satellites streaked across the sky while airplanes more slowly moved from horizon to horizon. Lying there alone in the wilderness with your son having a casual conversation was surreal and memorable and an experience I will cherish. Not everyone is as lucky as I am to have the relationship with a son who has similar passions and interests and who enjoys spending time with his Dad. Corey is my only son and has always been anxious to go whenever I suggested a trip in the airplane. He has been my traveling companion many times through the years and we have done and seen things that have bonded our relationship. I will always be grateful to the airplane for being the vehicle that took us to these amazing and rewarding places that so few have experienced. Whether it’s an airplane, a horse or a 4 wheeler, or a gun or a football or a chess set, sharing a hobby or activity and time with your son or daughter produces something money will never be able to purchase. I have traveled in the airplane to exotic places with each of my 3 children, my 2 son in laws and one of my grandchildren and have only experienced positive and rewarding relationship-building moments. Each trip has been very memorable. Morning brought overcast skies that looked threatening so we decided to take advantage of the cooler temperature and wander up the road to the site of an old ghost town. Instant oatmeal with raisins and sugar was quick and easy and then we headed off with my camera gear, a new gun that Corey recently purchased and plenty of ammo. 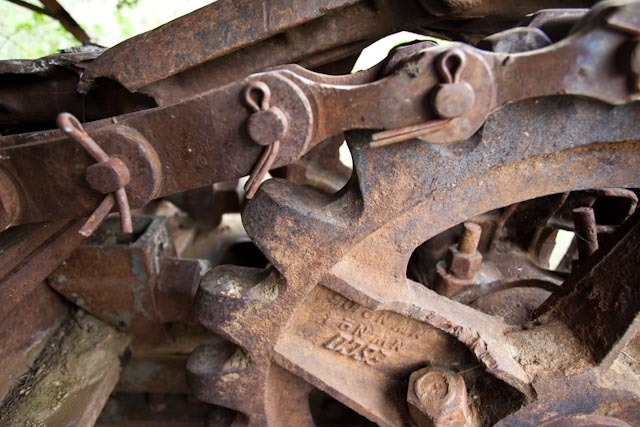 We followed a dirt road and soon came to an old rusted and abandoned crane. We crawled around, through and under this old crane wondering how it came to be where it was and what its job had been. Obviously, it was not worth moving back to civilization when its job was finished and so it was left where it stopped. I assume it was built in the 30s or maybe the 40s and that it must have had some mining purpose in its day. The engine had been removed and was sitting some 200 yards away where I think a cabin stood that has since burned down. It was disassembled partly and drew my attention because of my mechanic obsession with engines and machines. The crane, with all its levers, gears, and drive mechanisms was fascinating to me as I tried to follow the power train and understand what made this amazing machine work back in its day. It must have been so advanced and made easy work of what had previously been back breaking manual labor. What an awesome piece of history now resting forever in the middle of nowhere, not unlike an archeological Indian ruin. I must have spent an hour looking at this thing until finally deciding to move on. Just a little further up the road, we started to see signs of what I thought must be the ghost town I had read about. 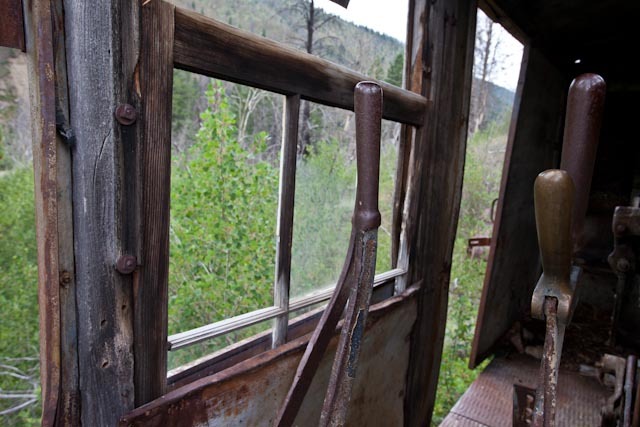 In my mind, I had seen an image of a typical ghost town with dilapidated cabins, structures, and equipment. There were no remnants of buildings, only depressions in the earth where a cabin may have stood over 100 years ago. I found a couple glass bottlenecks that were possibly from that time period and could only imagine what this little town of 1500 people in 1879 must have looked like. Gold had been discovered in this region and in a short one or two hundreds of opportunists had flocked here to make their fortune. The gold was apparently a very high grade but it seems it soon became obvious that it was very difficult to mine. Almost as soon as this little town sprang up it began to shrink down and within a couple years the remaining mine claims were all sold to Chinese miners who continued to work the area for a few years. I am sure that fires have swept the area several times and destroyed all the structures. There was a gulley near the edge of what we perceived to be the town that was littered with hundreds of tin cans and other rusted metal items. This must have been the dumping ground for the folks who lived there. I was intrigued to imagine what the area may have looked like and how the people got by and what life was like for them. History fascinates me. Not very long ago fire has burned a lot of the area. There are still many healthy conifers in the area but also patches of the burned remains of large pines. New growth is coming in and eventually will fill in. It’s interesting how a fire can clean an area out and actually have a beatifying effect within a few short years. Heavy winds must have blown down the narrow canyon recently because nearly all the larger remaining dead trees still standing have been broken off and tipped over about 15 feet from the ground. When I was a kid my Dad taught me to shoot guns and we spent a lot of time hunting together. We also went to the shooting range often and reloaded our own bullets. He taught me about gun safety and gave me a deep appreciation for them. He gave me my first gun when I was 5 years old for Christmas and I have owned and enjoyed guns since. I suppose my interest has transferred to Corey and multiplied. He is obsessed, so anytime we go somewhere we could possibly shoot he makes sure we bring guns. He and I bought a HMR 17 caliber rifle a few years ago and have really enjoyed it. Its very accurate and we enjoy challenging ourselves with difficult targets. Corey recently bought a Sig Sauer P238 380 auto handgun and we were anxious to shoot some rounds through it. For a small frame gun, it was a pleasure to shoot and very accurate. We shot all the ammo he had through both guns. Shooting is a skill that requires a lot of concentration and practice to be good at it. It’s a fun challenge to compete with yourself or others and I am intrigued with the intricate and precise characteristics guns are manufactured with. Sunshine replaced the overcast skies by about 2 pm and the temperatures started getting pretty warm. We decided to spend the afternoon down at the creek in the shade where it would be cooler. We took our fly rods for some casual fishing and spent 3 or 4 hours just taking it easy fishing, watching the wildlife and relaxing. We were at one point fishing near a rock outcropping when on the opposite side of the creek a mink popped up out of the water next to the rock. My jaw dropped as I watched it scurry up, around the rock and into the brush. Soon 5 more little mink ran single file spaced by about 12 feet from around the back side of the rock and followed the path of the first one. What an awesome sight. My only regret was my camera was nowhere near. One of the aspects of camping I enjoy the most is food. I love cooking over a fire and trying new things. Rib eye steaks were on the menu for this night and all I needed to do was get some good coals going. 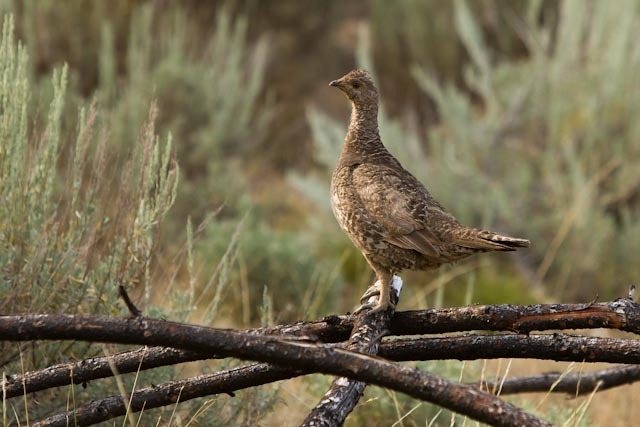 While waiting for that I noticed a family of grouse comes strutting through our camp so of course I got distracted getting some photos while I had a few minutes. While the meat was cooking I stirred up a brownie mix and put it in the Dutch oven and cooked it for about a half hour. A few bricketts give great temperature control making this treat a real easy desert. The steaks turned out perfect and we were completely satisfied. The next couple hours were deep in conversation on various pilot topics. Since Corey is beginning to prep for his check ride we started discussing things like weight and balance, density altitude, aircraft performance and regulations. I want him to be as prepared as possible when the time comes and we covered a lot of ground. We also talked at length about the pros and cons of various pilot jobs. He is motivated to get through all his ratings as quickly as possible and get into a flying position. Its fun to talk shop with him and dream about the future. Our plan was to head home early evening Sunday once the afternoon winds died down. I tend to be very conservative about flying in the mountains during the middle parts of the day. The air is seldom stable between 10 or 11 am and about 6 pm or so and flying down in the canyons in unstable air is not something I enjoy. Backcountry flying for me is recreation and I don’t do it often enough to be an expert so I will opt for being conservative as I can. I find the early mornings my favorite time to fly in the canyons. Since we had all day before we would leave and the early morning air was nice we decided to fly out for breakfast. 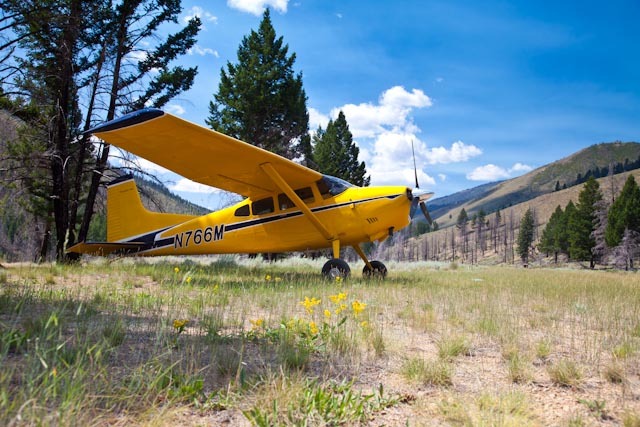 Sulphur Creek is about 20 miles from Upper Loon and is a private airstrip many pilots go to for breakfast. They offer 2 meals for breakfast on the menu, big and little. You just need to figure out how hungry you are. We worked our way over a few drainages and descended into the Sulphur Creek valley. A lot of chatter on the radio made us both pay attention because there were numerous aircraft reporting arrivals and departures to and from Sulphur Creek. We picked out the Super Cub we would follow into the strip and while I did the flying Corey snapped a few photos. 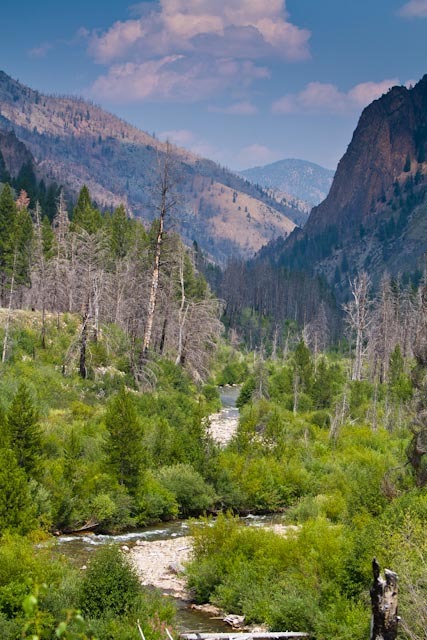 It’s a gorgeous valley with a winding slow stream making its way toward the Salmon. The low sun angles from early morning made the green foliage as vibrant as could be. On about a mile and a half dogleg to final we saw a huge bull moose, grazing near the stream. The approach is unobstructed and comfortable to the 3300 foot long dirt stip. The only hard part is paying attention to your flying duties instead of being distracted by looking out the window at the amazing scenery. 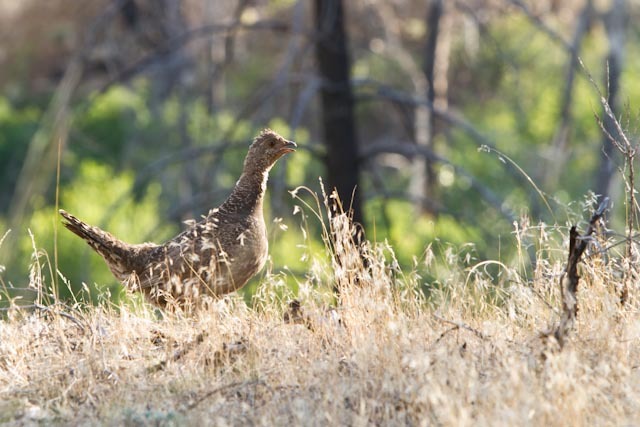 Sulphur Creek is a private guest ranch and offers overnight accommodations, horseback riding, guided hunting and fishing, as well as meals. They are well known for fly-in breakfasts and are centrally located enough to draw pilots from all around the region. We ordered the small sized breakfast and found it to be plenty of food. I don’t know how a person could get through a large size. The staff was very friendly and I visited with a couple friends I unexpectedly ran into. We didn’t stay long because I wanted to get back before the winds kicked up. The approach back at Loon Creek in a lightly loaded airplane having recent familiarity of the surroundings took away any anxieties that may have been present during our initial arrival. This is the kind of flying pilots live for and I stepped out of the plane feeling like a very lucky guy. Back at camp, we remained in total relaxation mode enjoying the peace and talking more about Corey’s upcoming flight test. Throughout the day, the winds would occasionally whip down through the canyon with varying degrees of intensity and from all directions and Corey was able to see the unpredictable nature of winds in the mountains. As the afternoon turned in to evening the winds slowly calmed to a point I felt comfortable with a takeoff and we loaded the plane. It was 6:30 as we lifted off and headed for home. Turbulence rocked us until we got out of the mountains and into the flat farming area where we landed in Jerome for fuel. It was a beautiful flight home, smooth as could be and peaceful as the sun set on the tail of the airplane. Thunderstorms moved perfectly out of our way at our home base as we arrived at Skypark just after dark. A crosswind remained just to keep me on my toes and remind me that the flight is never complete until the plane is safely in the hangar. Now that I am home I am really pleased we chose to stay at Upper Loon Creek. I always seem to enjoy our trips in the airplane and this was certainly not a disappointment. I will most definitely return to fish. We caught some really nice trout and they were much bigger than at most other locations I have been in Idaho. If there were any negative to Upper Loon it would be that there is a road running through the area. We didn’t see much traffic but just the thought of a road through there seemed to make it a little less isolated and a little more mentally connected with the outside world. I really had a great time and will add this place as another option of really cool locations to go with the airplane. I enjoyed your website but your history of Sulphur Creek Ranch is incorrect. My father-in-law, Dr. Ben Morgan bought the property from Web Appel, barnstormer and mechanic and aviation entrepreneur. Dr. Ben funded the operation and hired Hornback to run it. Included in the sale was a Zenith biplane, traded to Bill Woods for flying services. Woods also owned a slot machine business. The Zenith is now beautifully restored in St. Louis.